We live in epic times for tea drinkers! 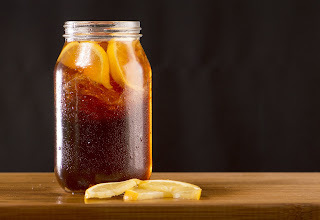 There are so many wonderful flavors to choose from, and if you love iced tea like I love iced tea, it's easy to have a bottle on hand at all times without spending an arm and a leg on the pre-brewed stuff and without boiling water and waiting for the tea to steep. I just use an empty liter bottle from a past pre-brewed tea purchase, but you can buy a nice bottle or pitcher for the purpose. I add two of the big cold brew tea bags or four to six of the smaller ones depending on how strong the tea is. I fill to the top with water, put the bottle in the fridge, and, voila, iced tea! The pre-brewed teas I like cost anywhere from $2 per gallon to $2 per liter. Using the cold brew tea bags costs pennies per serving. You don't really need cold-brew specific tea bags. I've found that popping any tea bag into cold water and allowing it to steep will yield the same results. But the cold-brew specific bags that appear at the end of this post have excellent flavor, and you can't go wrong with them. Tea is tasty, healthy, and doesn't need to be expensive. Drink up!